Radon is an inert, radioactive gas produced from the natural decay of the uranium present in most rocks and soils. The greatest uranium concentrations are in underground rocks such as granites, phosphates and shale. Radon released outdoors disperses in the atmosphere. It penetrates buildings through cracks and drains and accumulates in unventilated lower floors. Granite is a rock formed by the slow cooling of molten magma within the Earth's crust. Crystal growth within different types of granite gives the rock its decorative quality. The popularity of granite countertops in home decoration triggered concern about health hazards associated with emitted radon. Granite is a popular material for kitchen countertops. Radon is an inert, radioactive gas produced from the natural decay of the uranium present in most rocks and soils. The greatest uranium concentrations are in underground rocks such as granites, phosphates and shale. Radon released outdoors disperses in the atmosphere. It penetrates buildings through cracks and drains and accumulates in unventilated lower floors. Granite is a rock formed by the slow cooling of molten magma within the Earth’s crust. Crystal growth within different types of granite gives the rock its decorative quality. The popularity of granite countertops in home decoration triggered concern about health hazards associated with emitted radon. US. scientists in industry, universities and government service conducted a series of investigations into radon radiation from 13 types of granite countertops available in the American market. They concluded that radon emissions from decorative granite were below background levels of radon found outdoors. During the testing, only three types of granite produced measurable amounts of radon. The Environmental Protection Agency recommends that background radon in a building should not exceed a precise level of concentration in the surrounding air. The EPA terms this number its "action level" and specifies it as 4 picocuries per liter of air, where a picocurie is the measure of radiation concentration. Householders should reduce their radon exposure if background concentrations exceed this figure. 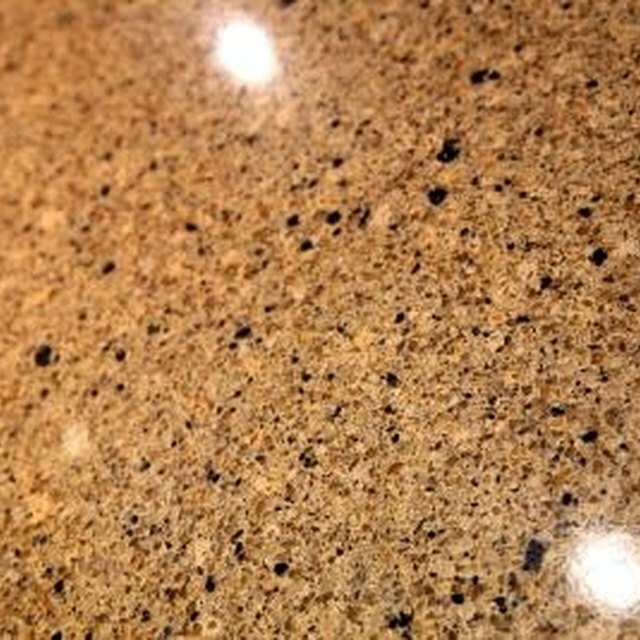 Crema Bordeaux is a coarse pink to red migmatite granite from Brazil. Migmatites evolve when tectonic forces squeeze and stretch molten magma as it cools slowly. The magma incorporates some surrounding rocks and deforms them. Most granites cool into uniform-sized crystals while migmatite cools into varied sizes of crystals set in long swirling patterns. Veins of black or green-black metal ores spread through the rock. This granite tested the most active in terms of radon emissions, but the emissions were less than 7 percent of EPA’s actionable radon level. Tropic Brown is a medium-grained brown granite from Saudi Arabia with large crystals of potassic feldspars that color it brown. It is quarried in the Najran region of eastern Saudi Arabia, close to the border with Yemen. It was second in terms of emissions and contributed less than 1 percent of the EPA’s actionable concentration level of radon emissions. Baltic Brown is a black-brown granite from Finland that is quarried close to Finland’s border with Russia. Like its Saudi Arabian counterpart, the brown color comes from crystals of potassic feldspars. Baltic Brown was third in radon emissions and contributed less than 1 percent of EPA’s limits.